struction sessions that emphasized linguistic and meta-linguistic skills in the second language (English). results are discussed in light of the findings in the literature as well as suggestions for future research. take place in the opposite way as well. 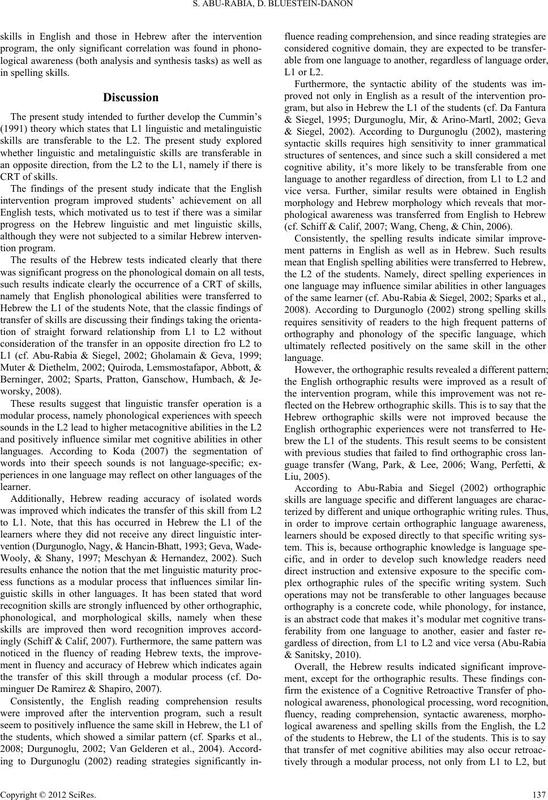 L1 but also in a second language (L2) (Cisero & Royer, 1995). base for decoding skills in general (Koda, 2007). readers in both languages was also present. lems in transferring these skills (Lee & Schallert, 1997). tute with their grades being average and above. disabilities read English as an L2 better than Swedish as an L1. puter and music—a factor that assists in the learning process. orthographic character of a language play a role in this matter. tence in order to pronounce it correctly. rather than its pronunciation (Siegel, Share, & Geva, 1995). cation in a second language. in the L1 (Turkish) and L2 (Dutch) was found. 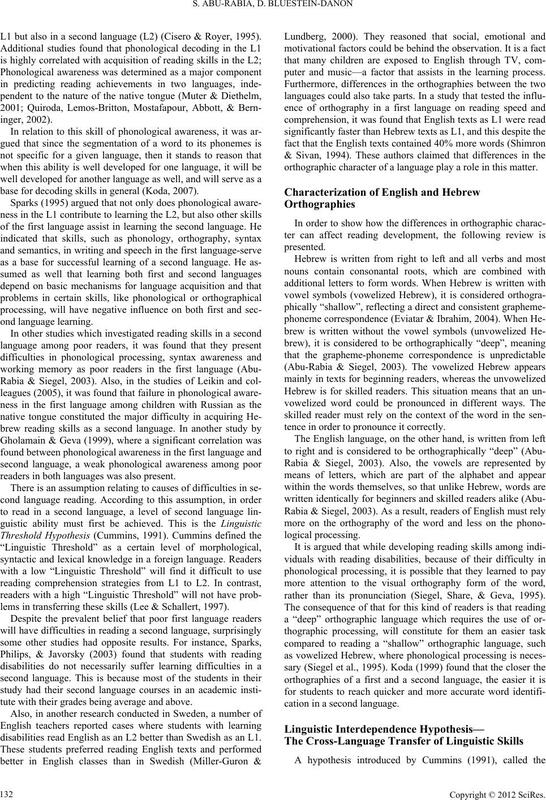 English (Wang, Perfetti, & Liu, 2005). (Domínguez De Ramírez & Shapiro, 2007). first language is Arabic and second language English. ğlu, Mir, & Ariño-Martí, 2002). that shares a similar morphological structure. sistent (“deep orthography”) will have greater difficulties. those alphabetical orthographies that are considered shallow. 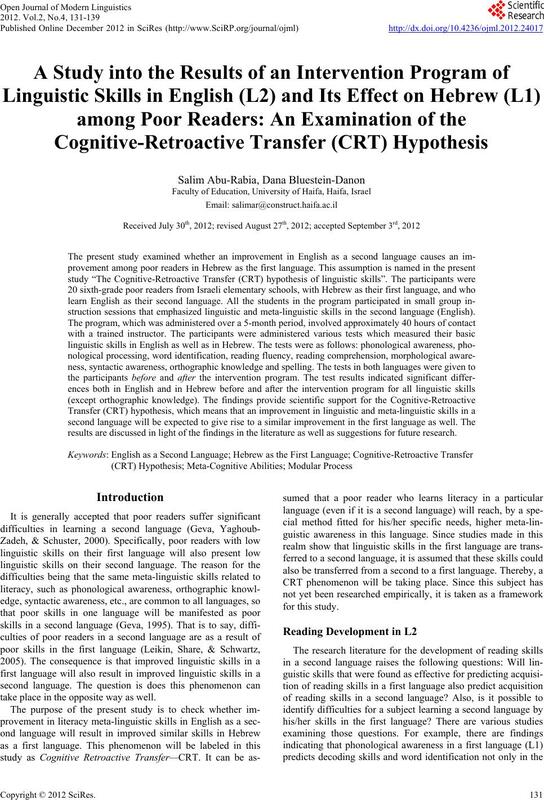 called Cognitive Retroactive Transfe r—CRT. in English, were classified as poor readers. he had to combine the phonemes to form a complete word. (2006). The Hebrew version was developed by Shany et al. Morphological Awareness Tests in English and Hebrew. the same sentence are inflections of the same infinitive/root. responses out of the total was calculated. awareness in English and in Hebrew was examined differently. centage of correct responses out of the total was calculated. rect responses out of the total was calculated. correctly during one minute of reading. were given in one of the two languages. nemes, as well as synthesize phonemes into complete words. printed in a list, so the participants could study them at home. words taken from that list. nally giving a title to each paragraph. ries of lessons in which English linguistic skills were studied. given by one of the authors who is a qualified remedial teacher. each, taking place twice weekly. and after the intervention program. tasks in English before and after the intervention program. tasks in Hebrew before and after the intervention program. the orthographic knowledge in Hebrew (Z = –1.90; p > .05). subjects in English and in Hebrew (rs = .48, p < .05). and syntactic awareness (rs = .26, p > .05). linguistic skills, with the exception of orthographic knowledge. minguer De Ramirez & Shapiro, 2007). (cf. Schiff & Calif, 2007; Wang, Cheng, & Chin, 2006). 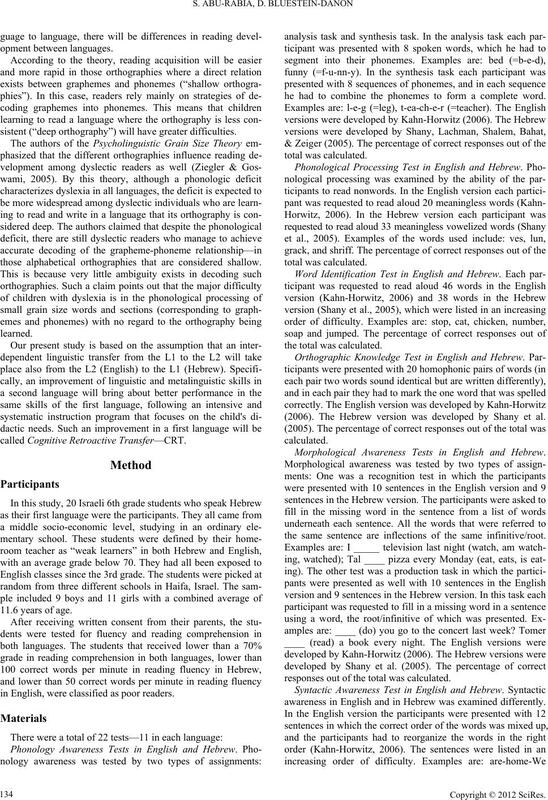 vance of the present findings across language acquisition levels. time, or disappear after a certain period of time? guage transfer of phonological awareness. New York: Longman. cation classrooms. 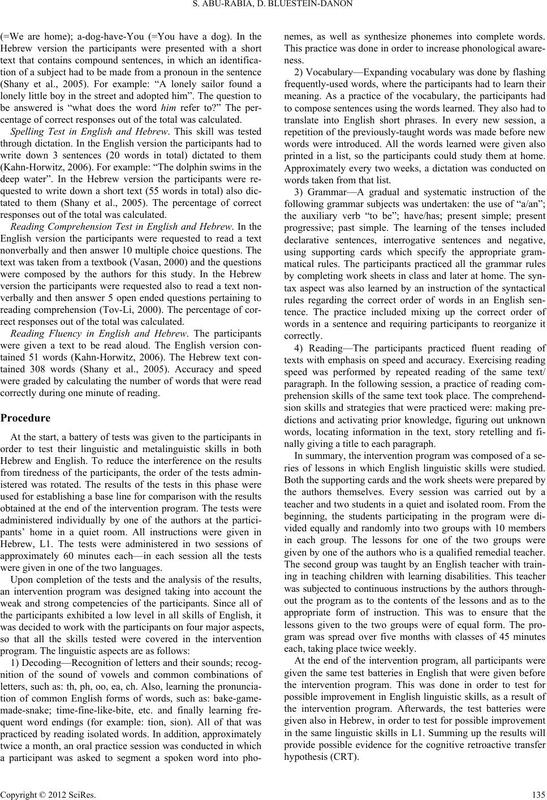 Psychology in the School, 44, 795-806.
proaches to understanding second-language writing (pp. 81-100). and literacy (pp. 277-291). Dordrecht: Kluwer. concurrent development of basic reading skills in two languages. 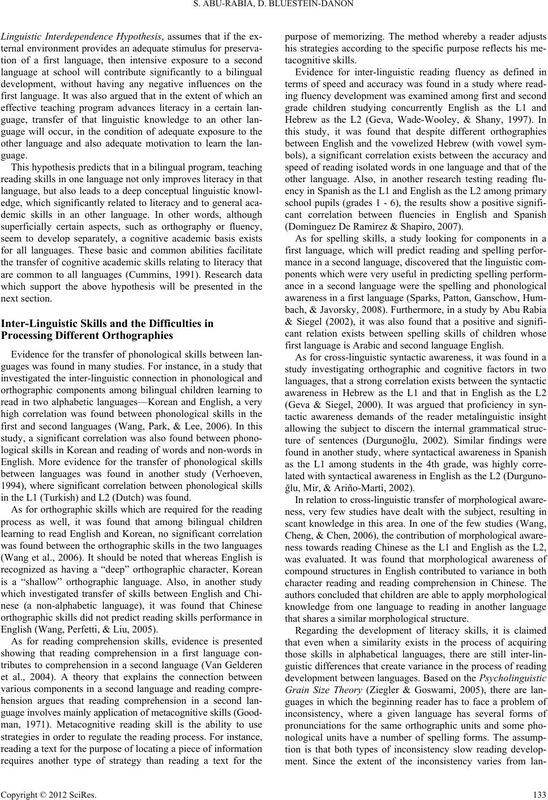 Reading and Writing: An Interdisciplinary Journal, 12, 1-30.
individual differences in word recognition skills of ESL children. Persian. Language Learning, 49, 183-217.
and decoding skills. 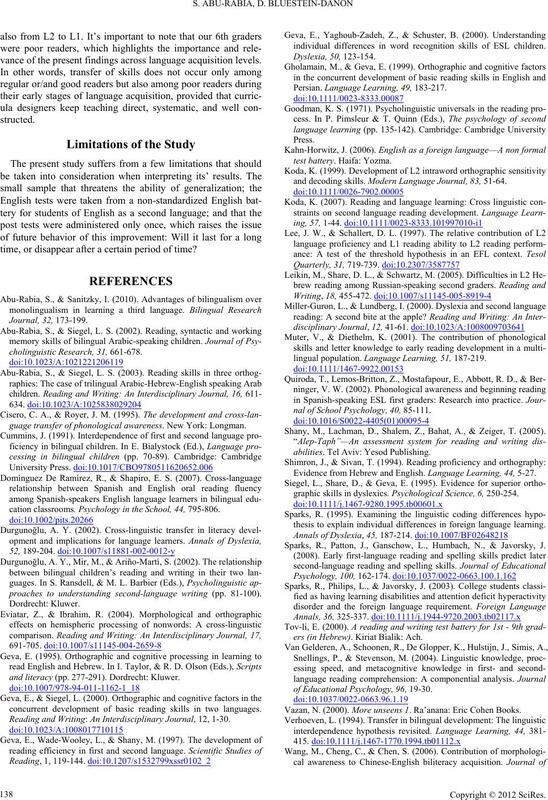 Modern Language Journal, 83, 51-64.
lingual population. Languag e L ear ning, 51, 187-219.
nal of School Psychology, 40, 85-111. 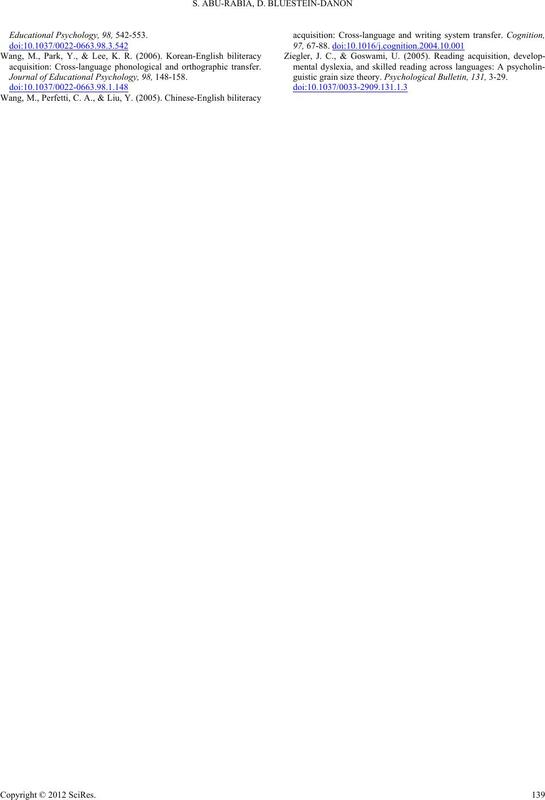 Shany, M., Lachman, D., Shalem, Z., Bahat, A., & Zeiger, T. (2005). abilities. Tel Aviv: Yesod Publishing. Evidence from Hebrew and English. Language Learni ng, 44, 5-27.
graphic skills in dyslexics. Psychological Science, 6, 250-254.
thesis to explain individual differences in foreign language learning. Sparks, R., Patton, J., Ganschow, L., Humbach, N., & Javorsky, J.
ers (in Hebrew). Kiriat Bialik: Ach. of Educational Psychology, 96, 19-30. Vazan, N. (2000). More unseens 1. Ra’anana: Eric Cohen Books. acquisition: Cross-language phonological and orthographic transfer. Journal of Educational Psychology, 98, 148-158.
guistic grain size theory. Psychological Bulletin, 131, 3-29.